The XA55 and XA50 are essentially the same camera just with the addition of an HD-SDI (3G-SDI in Europe) terminal in the XA55. Both use 1″-type sensors and use Canon’s Dual Pixel AF system. They have a 15x zoom that covers the angle of view we’d expect from a 25.5-382.5mm lens on a full frame system, and both offer a Wide Dynamic Range Gamma mode that Canon says increases the DR by 800% to improve detail in highlight areas and to produce more accurate color. 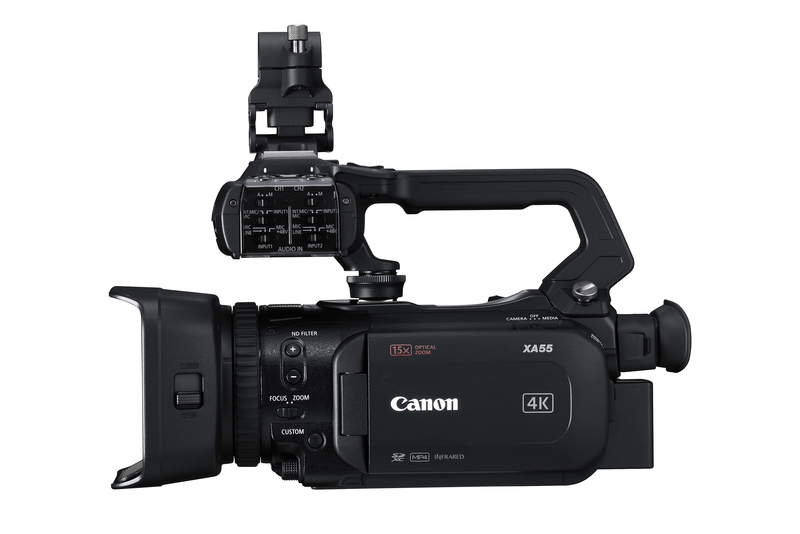 A fifth model launched at the same time has many of the features of the XA55 according to Canon, but is aimed at the budget/student market and doesn’t feature an overhead handle. The Canon VIXIA/LEGRIA HF G60 4K UHD uses a 1″-type sensor, has Dual Pixel AF and a 15x zoom with a variable maximum aperture.